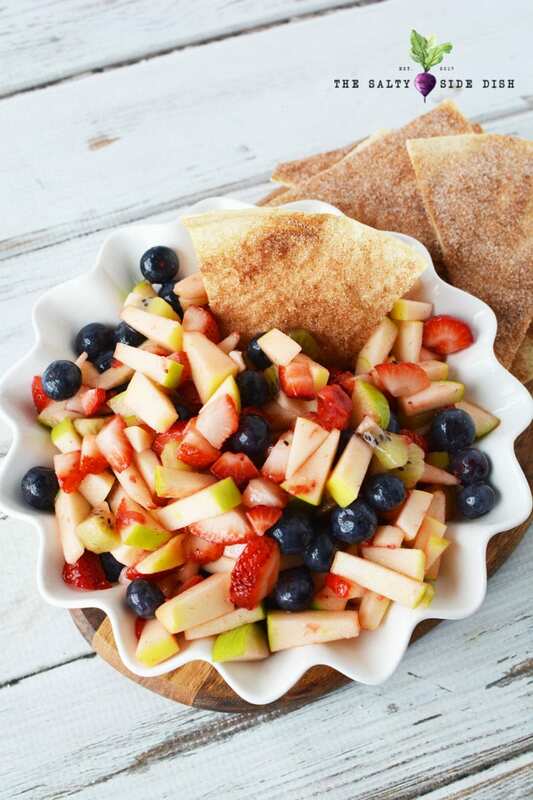 This delightful fruit salsa is just the perfect balance of sweet and refreshing fresh fruit. 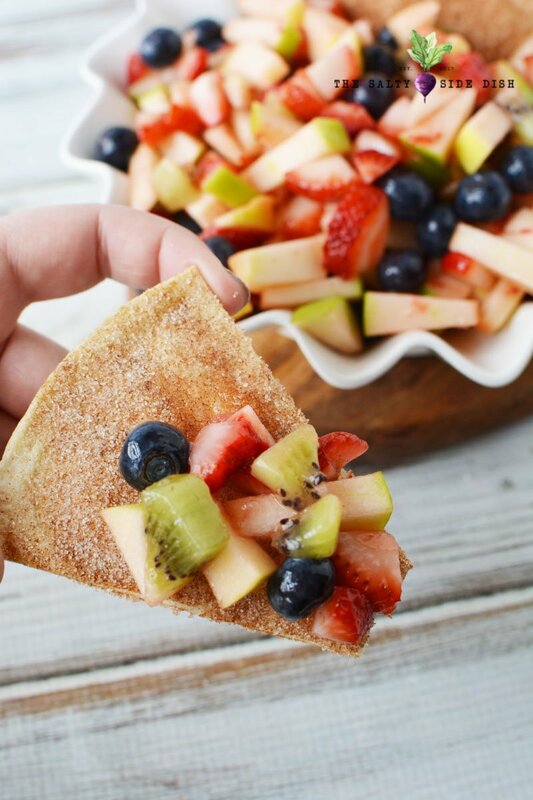 A completely fun appetizer or an after dinner dessert, you cannot go wrong with these favorite fruits chopped up and served to a pleased crowd on crunchy homemade cinnamon chips. 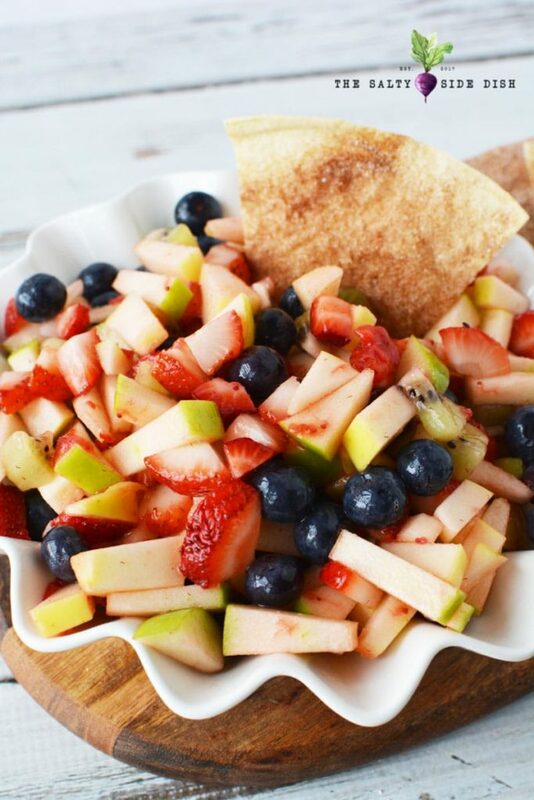 Move over salsa, dessert fruit salad just became a serious front runner! 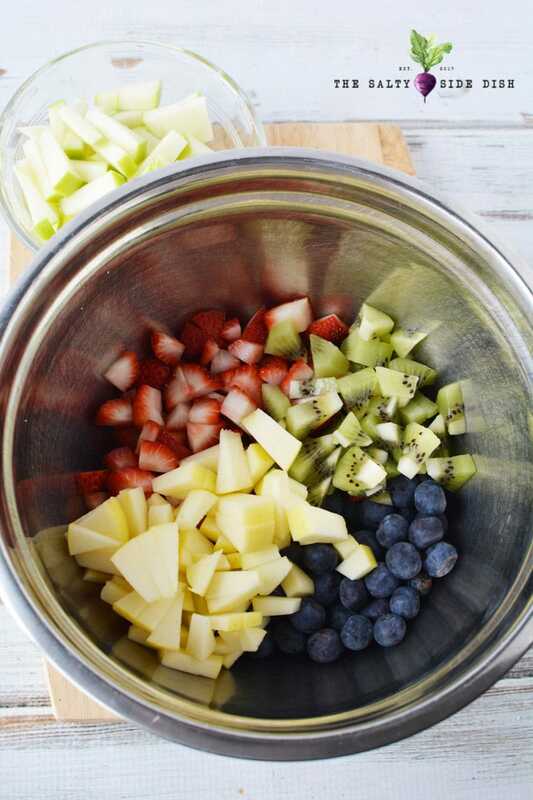 In this fruit salsa recipe, I used a variety of Delicious fruits and you can alter those in your own way to use fruits you love, but be aware that some fruits are more acidic or brown (like bananas) and can take away the pretty colors. Preheat oven to 350 and line a baking sheet with parchment paper (optional). 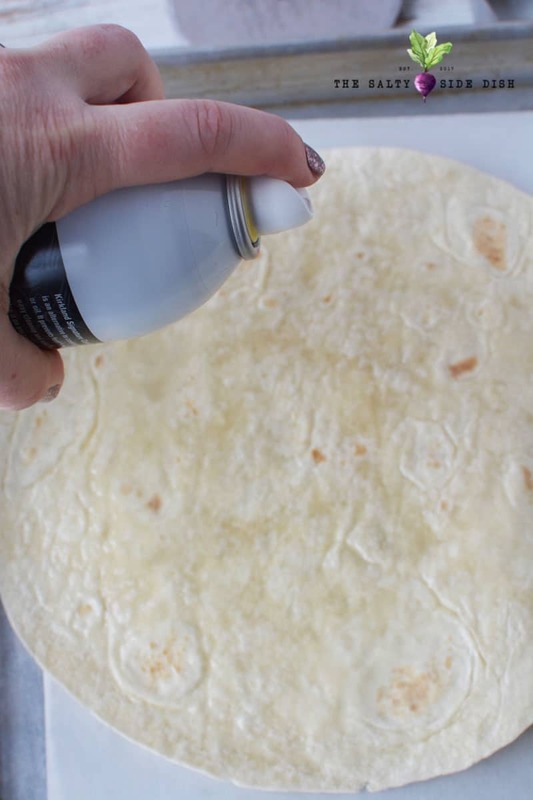 Spray tortillas with nonstick cooking spray and set on baking sheet. Use a pizza cutter or sharp knife to cut tortillas into wedges. Sprinkle generously with cinnamon sugar. Bake for 8-10 minutes or until crispy. Repeat until all tortillas are cut and baked. Let set to cool completely. 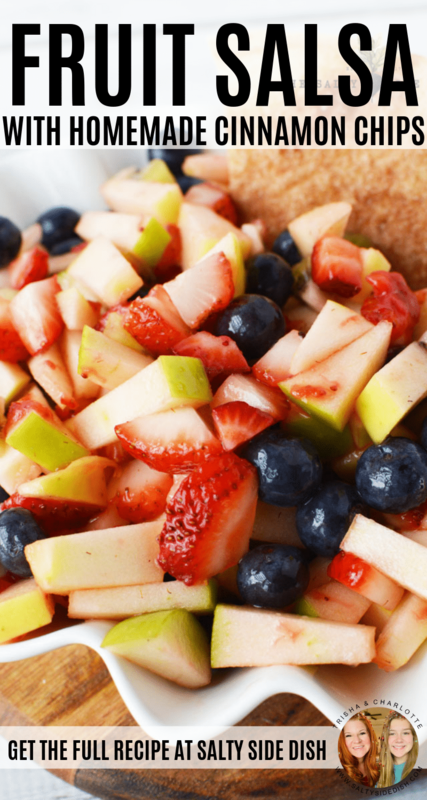 In a mixing bowl, add apples, kiwi, strawberries and blueberries and mix well. Add sugar, jam and lemon juice and mix well to evenly coat fruit. Let set in the refrigerator for at least 15 minutes. Stir well to coat fruit. Preheat oven to 350 and line a baking sheet with parchment paper (optional). Spray tortillas with nonstick cooking spray and set on baking sheet. Use a pizza cutter or sharp knife to cut tortillas into wedges. Sprinkle generously with cinnamon sugar. Bake for 8-10 minutes or until crispy. 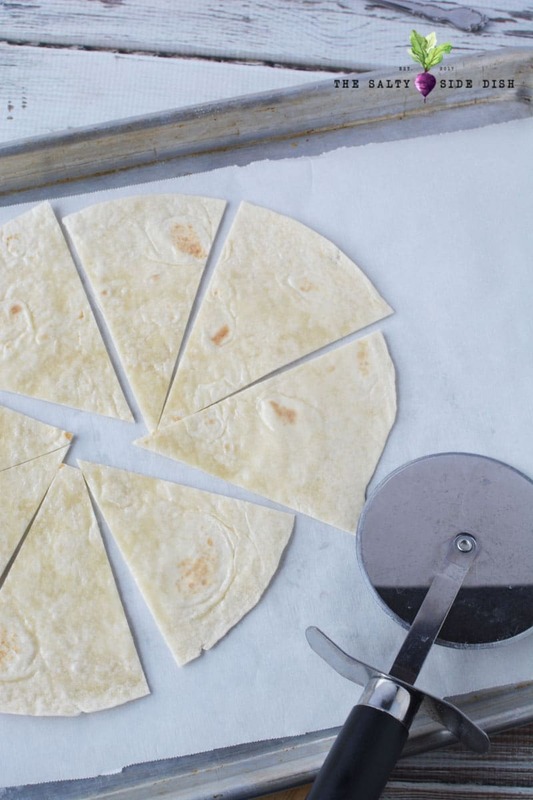 Repeat until all tortillas are cut and baked. Let set to cool completely. 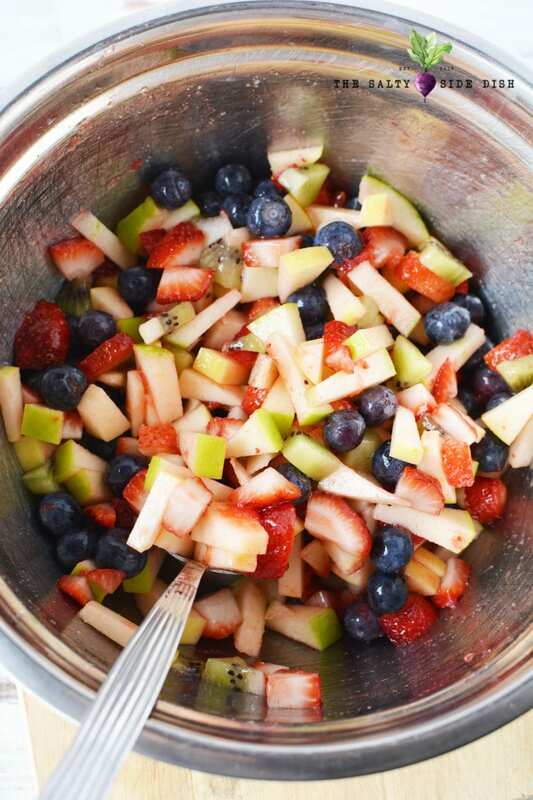 In a mixing bowl, add apples, kiwi, strawberries and blueberries and mix well. 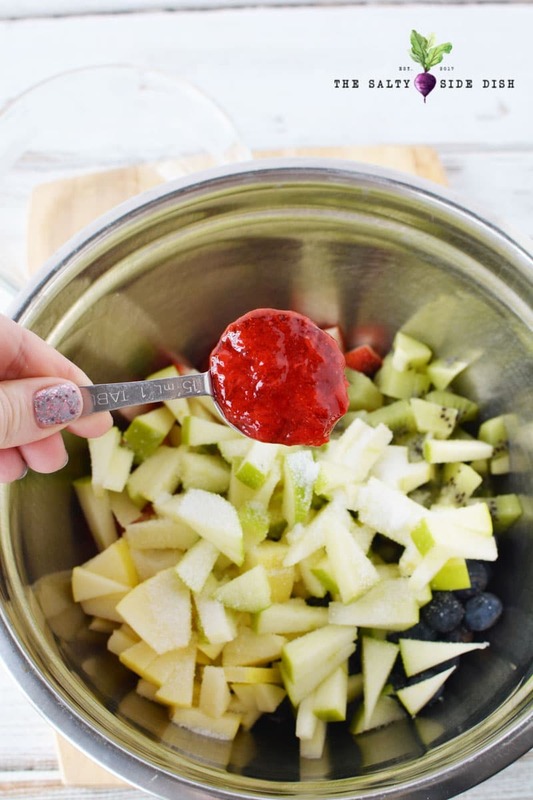 Add sugar, jam and lemon juice and mix well to evenly coat fruit. Let set in the refrigerator for at least 15 minutes. Stir well to coat fruit.